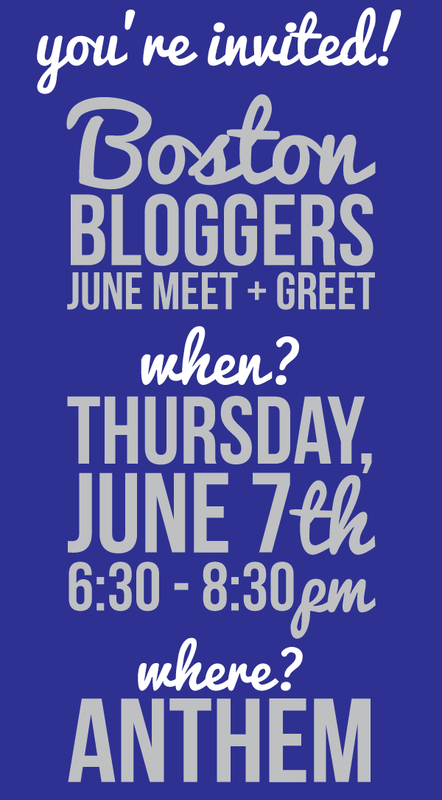 Boston Bloggers: Boston Bloggers June Meet + Greet! Boston Bloggers June Meet + Greet! Katy and Alison are happy to announce our June Boston Bloggers event! This meet + greet will be held at Anthem Kitchen + Bar on Thursday, June 7th from 6:30 to 8:30pm. With your ticket purchase, you guarantee your spot at the event, where you can mix and mingle with the best of Boston's blogging community. You'll also get a handy checklist of "who's who" at the event. We hope you can make it! Please note: We cannot offer refunds. However, if you are unable to attend, we would very much appreciate a heads-up. This will enable us to take someone off the waitlist. If you'd like to help sponsor this event, please email Alison for more information! We'd love to help get the word out about your business to an energetic and interested community of bloggers!